The start of a new range of models for B&O, the most striking feature being the new cabinet style. The new shape was as far removed from the classic 33XX/77XX series as could be imagined, taking a slim monitor style form, executed in contrasting black plastic and shiny painted resin. A dark tinted contrast screen covered the face of the tube, making the front of the set appear uniform plain black when not in use. 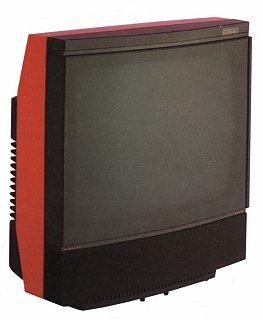 The colours were also somewhat of a departure, gloss black, metallic grey and bright red certainly looked fresh compared to the traditional teak and rosewood of the rest of the B&O television range, though gloss white, also available, was nothing new for a Beovision. Text copyright © Beocentral. Unauthorised reproduction prohibited. Another departure was the fitting of a carrying recess in the rear of the cabinet, leading to the suggestion that the MX 2000 was portable. Not since the demise of the Beovision 600 monochrome model had any sort of portable set been offered, though the size and weight of the MX 2000 meant that moving it was still not that easy! Such a radical departure in form would of course require a new chassis, there was no chance of fitting the large assemblies from the Beovision 7802 into the space available. Lacking anything suitable, B&O bought in chassis assemblies from Nordmende of Germany, the model chosen being the ICC3. These would not drive the 51cm 30AX tubes that B&O had used for their other small screen models, so alternatives were sourced from ITT videocolor and Toshiba, slight alterations being made to the scanning circuits to cope with the differences between the two. To the basic chassis, B&O added their own control system, control panel and mains transformer. The latest version of the Video Terminal remote control was used, and this could also operate a B&O video recorder. The Beocord VHS 82 was introduced in colours to match the MX 2000, and when used together, Hi-Fi stereo sound from the tape played through the television loudspeakers, and an on-screen programming system for the video recorder timer could be used. Text copyright © Beocentral. Unauthorised reproduction prohibited. In use, the sets could be adjusted to produce a subtle picture with rich contrast, and the built in Log-Line loudspeaker enclosures ensured that the sound quality was up to scratch, but being at least in part not a true B&O set, the overall results were never as good as models such as the Beovision 5502, a traditional B&O television of the same screen size made entirely in Denmark and available at the same time. Reliability was also not as good as the more traditional models, in particular the quality of the material used for the printed panel was poor, making it prone to cracked joints and burns. The most attractive feature though was always the cabinet, and the same basic shape would remain the mainstay of the Beovision range for many years. Text copyright © Beocentral. Unauthorised reproduction prohibited.